Enjoy complimentary use of all non-motorized equipment such as stand-up paddle boards, surf boards, snorkeling gear, and kayaks that you can take around the Island. Or treat yourself to a full or half day boat adventure to one of the many magical “islas” with their white sand beaches. Cala Mia offers plenty of relaxing, adventurous, or romantic water activities in Panama to choose from. 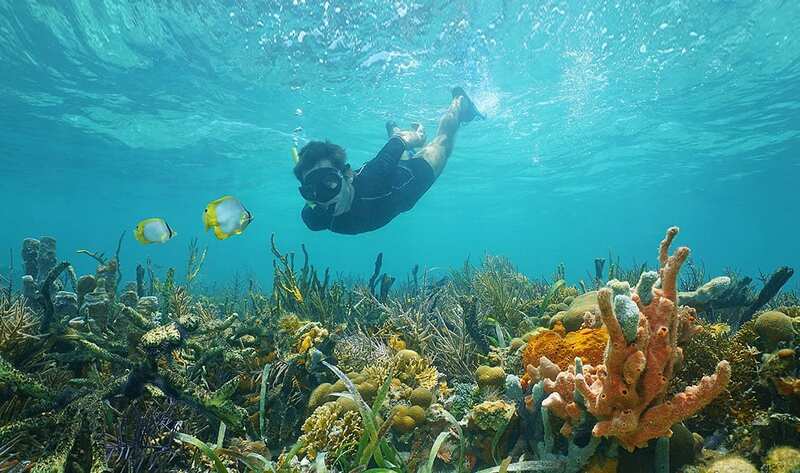 Take a tour on one of our boats to one of the best snorkeling spots in Panama. The trip comes highly recommended, as magnificent marine life exists not too far from our shores. The full day trip includes a 40 min boat ride and a picnic lunch on a pristine Island. You can spend your day swimming, sunbathing, or snorkeling while enjoying views of the stunning live coral reefs, colorful fish, and other exotic marine life that thrive in the area. The long stretch of a white sandy beach can cater to those who prefer a bit of privacy, while the rest of the group continues exploring the marine life around Isla Secas. Suitable for couples, groups of friends, and families with older children. Cala Mia staff will ensure your day is filled with enjoyable memories. Cala Mia has complementary stand-up paddleboards. Discover the magical feeling of floating around our Island in a safe and easy way. This incredible experience is an absolute must-do whilst on holiday. It’s easy to master and soon you will confidently glide over the tranquil waters around Cala Mia. Discover for yourself the world’s fastest growing sport at Cala Mia Island Resort. The perfect way to relax and enjoy a half day, take a cruise, and explore the surrounding islands. You’ll embark on a short 20 minute journey of discovery across the turquoise waters of the Gulf of Chiriquí to the unspoiled Isla Gamez or Bolanos, where the cool shade of swaying palms fan over white sandy beaches. The white sandy beaches are great for swimming, snorkeling, or just relaxing with a picnic lunch. Lunch and refreshments can be added to the package, so you can just sit back and unwind yourself. Suitable for couples, friends, and families, Cala Mia’s staff will ensure your day is filled with enjoyable memories. Sea kayaking is just one of the many water activities in Panama that make your trip to Cala Mia a unique Island adventure! Our complementary kayaks ensure you can freely explore this remote tropical coastline, stop to admire numerous sandy beaches and our pristine natural environment. For beginners, our protected waters around Cala Mia bay gives you time to learn the kayaks, then you’ll be ready to paddle off in search of fun and adventure. For the more adventurous guest looking for some exercise, you can paddle around the Island and, tide permitting, into a hidden mangrove jungle. The journey of paddling through the still waters of a secluded mangrove jungle is an experience unlike any other. On the way you may spot some of the unique local wildlife in this isolated ecosystem.